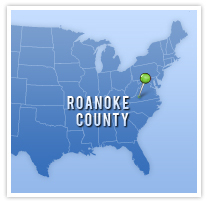 The Roanoke Valley is located in southwest Virginia, within 500 miles of many of the major business, economic, and population regions of the United States. Its central location and proximity to major interstates puts the Roanoke Valley within a day's drive of two-thirds of the United States. Combined, the area is 1,876 square miles at an average elevation of 1,149 feet.